UPS, along with Frito-Lay, have become testing grounds for alternative fuel vehicles in delivery fleets. You may have noticed that UPS was given a lot of attention last week for adding 1,000 propane-powered delivery trucks to its US fleet – joining up with electric, hybrid, CNG, LNG, biomethane, and nearly 900 propane-powered trucks in its Canadian fleet, in the corporation’s sustainability initiative. 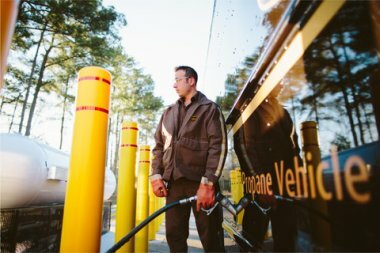 UPS will also initially install 50 propane fueling stations at UPS locations mainly in rural areas in Louisiana and Oklahoma with other states pending. That $70 million vehicle and fueling investment will allow UPS to displace about 3.5 million gallons of conventional gasoline and diesel per year. Propane Education & Research Council (PERC), a non-profit propane technology incubator, is playing a key role in integrating propane autogas and refueling with the UPS fleet. UPS and PERC were able to secure certifications with the US Environmental Protection Agency (EPA) and the California Air Resources Board, in alliance with equipment manufacturers. UPS did a test run this past winter in Gainesville, Ga., with 20 propane-powered delivery trucks, and expanded its order with Freightliner Custom Chassis Corp.
“The opportunity to road test new propane vehicles and fueling equipment with one of the most sophisticated fleets in the country is a major milestone for the propane industry,” said Roy Willis, president and CEO of PERC. The UPS deployment of propane vehicles and refueling infrastructure is a smart move and good investment, Willis says – making greater use of clean, efficient energy resource with growing domestic supplies. Willis says that other fleets, such as beverage companies and bakeries, are starting to show a lot more interest in propane – as what UPS does is carefully observed. Fleet managers need to see a business case made that propane-powered vehicles are worth the investment. They know UPS takes logistics very seriously and tests out the technologies and fuels long before adding them to their fleet – such as the test fleet in Georgia. PERC has been collaborating for several years with Freightliner, CleanFuel USA, and Powertrain Integration to build safe, clean, and efficient propane vehicles. UPS will be using CleanFuel USA’s Liquid Propane Injection (LPI) system in the planned purchase of the propane delivery trucks. CleanFuel USA will also provide several of the fueling stations out of 50 planned across the US. The UPS delivery truck is built on the Freightliner Custom Chassis MT-45 walk-in van with the LPI system, and a 6.0-liter engine by Powertrain Integration. The school bus market has been adding a lot of propane-powered buses, Willis said. Bluebird sold about 3,600 of these propane school buses last year, and Thomas Built will be introducing a new model soon. PERC is also working on dual-fuel research projects combining diesel and propane. Direct injection of propane is also being tested by PERC with the Southwest Research Institute. Direct injection can bring better horsepower and torque, plus fuel economy improvements. While most propane vehicles have been deployed in medium-duty fleet vehicles, direct injection could be a bridge to bringing propane to more light duty passenger cars like taxis and police cars. It could be an OEM product with warranty coverage at its dealerships and may be announced by the end of the year, Willis said. 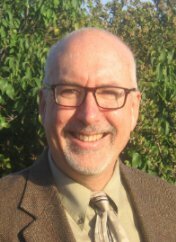 The technology is pretty well proven, according to Willis, with propane-powered vehicles widely used in fleets for several years. The fueling infrastructure is growing – such as school bus fleets adding them to maintenance yards and propane retailers bringing them to their local markets at public stations, which have been supported by state grants and incentives. The UPS announcement is probably a tipping point for more fleets to adopt propane in vehicle and fueling technologies.